You do not need to think about bundling such saunas - all components of the model saunas and get tested on the experience of your predecessors use. Rubbish after construction quite a bit - one of the cardboard packaging components. Screwdrivers package will remain forever with you and the economy today. Instructions from the manufacturer in Russian. 15 mm, decorative reddish alder. brooms, textiles or cosmetic sets. the "Recommendations". 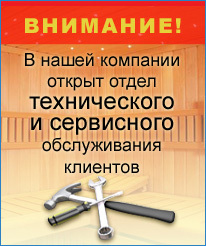 At the "Details of the sauna"
question remains unanswered - call, will be happy to help you.